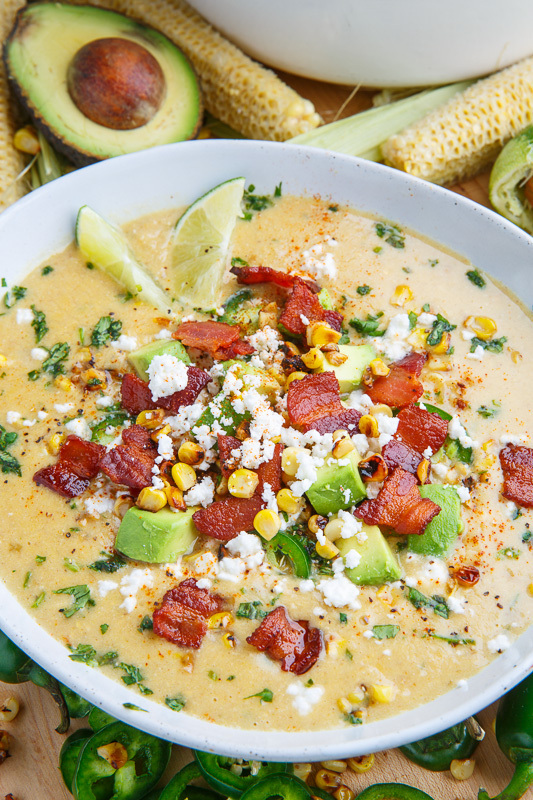 All of the amazing flavours of Mexican style street corn in soup form! Yum! Mexican street corn, grilled corn on the cob all slathered with butter, mayo, lime juice, chili powder and crumbled cheese, is one of my favourite foods and I was recently thinking that it would be good in the form of a tasty soup! 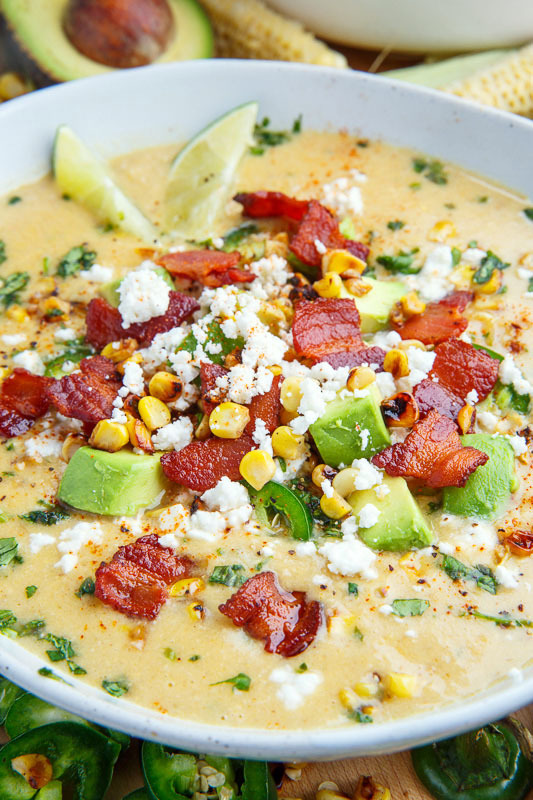 This soup has a base of, you guessed it, corn and both fresh and frozen work but fresh is the best! I like to add the corn to the soup in two ways, I like to puree the corn into soup t make it nice and thick but I also like the flavour and texture of the full kernels so I grill or char some of the corn and leave it whole. The flavours of the Mexican street corn are built up with the butter, sour cream, lime juice and crumbled cheese! Heat is added in the form of jalapeno peppers and a garnish of chili powder and I like to kick up the flavour with a hit of fish sauce and miso paste which adds umami! 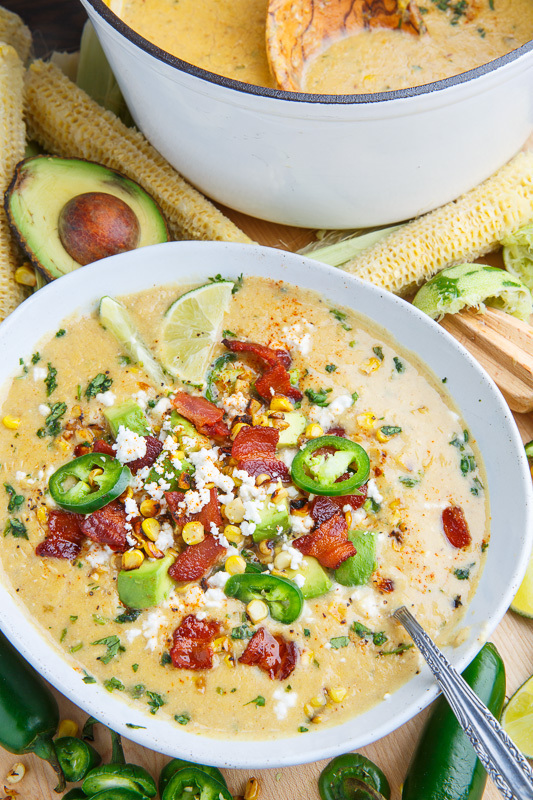 Of course I could not make this soup without bacon and I almost need nice big chunks of avocado! 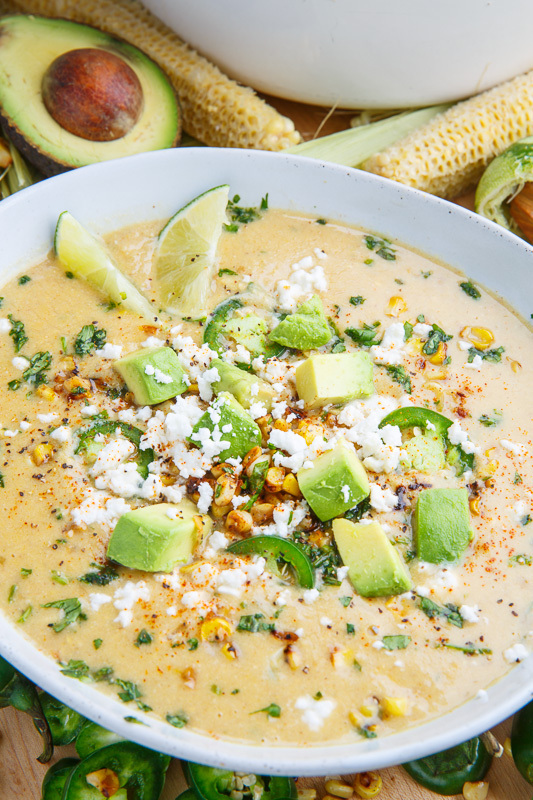 This Mexican street corn soup is great either warm or chilled so it’s perfect all year round! Melt the butter in a large sauce pan over medium-high heat, add the corn, toss and let it sit cooking until lightly charred, about 6-10 minutes, mix it up and let it char again, about 6-10 minutes, before setting aside. Add the onions and jalapeno and cook until the onions are tender, about 3-15 minutes, before adding the garlic and cumin and cooking until fragrant, about a minute. 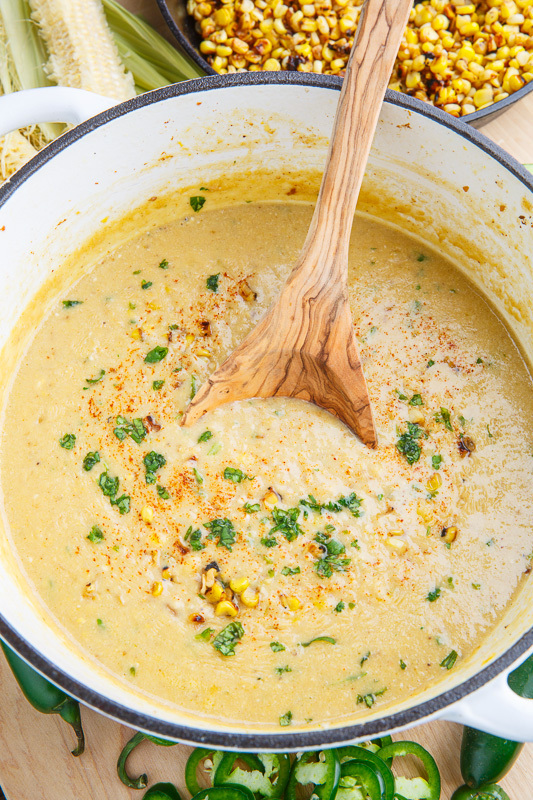 Add the broth and uncooked corn, bring to a boil, reduce the heat and simmer for 10 minutes before pureeing, partially or completely, with a stick blender or in a blender or food processor. Add the charred corn, sour cream lime juice, fish sauce, miso paste and cilantro before seasoning with salt and pepper to taste and serving topped with crumbled cheese! Tip: If you are using corn from the cob, after you have cut the kernels from the cob scrape all of the juices from the cob with the back of a knife! Option: Simmer the cobs of corn in the broth for 15-20 minutes before using the broth to infuse it with even more corn flavour! Option: Start by cooking 4 strips bacon until crispy, set aside and using the 2 tablespoons of the grease in addition to the butter to cook the corn and garnish the soup with the crumbled bacon! Option: Add extra jalapeno peppers to taste! Option: Add 2-4 tablespoons of mayonnaise which is sometimes slathered on Mexican street corn. Pretty sure I could live off of this soup. I love everything about it! 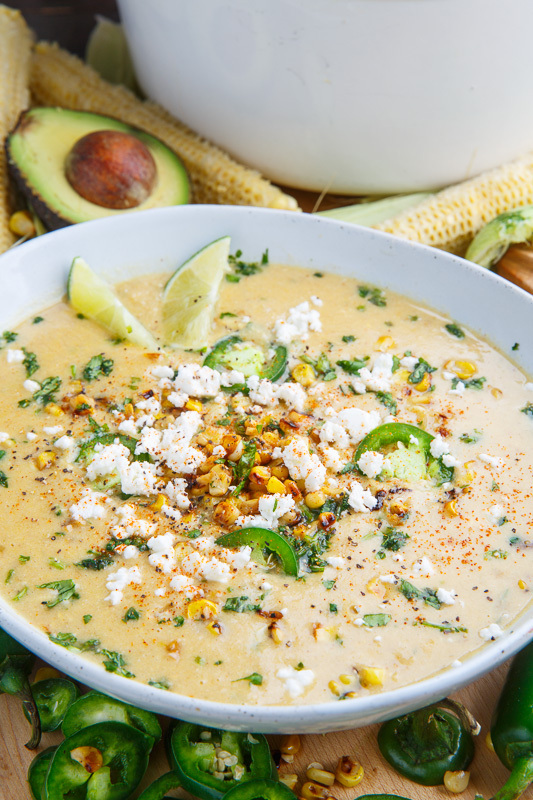 I've love Mexican street corn, I've made it into a salad, but I have to say, Mexican street corn soup has to be the coziest way to enjoy this favorite summer treat! Oh my, I have to make this! I could "soup" just about anything; this was a great idea! This is so intriguing. I'm going to have to give it a try! This soup looks great for the cold weather we are having in Telluride! Can't wait to try this soup. Looks and sounds delish!!!! I love to taste this recipe! The ingredients list "2 cups corn" then "4 cups corn". Do you need a total of 6 cups? I don't see where it says to add the different amounts separately. This looks like a great soup to make. I'm excited to try it out! Unknown: Yes, 6 cups in total, 4 pureeded into the soup and 2 charred and served on top. Enjoy! Is this something that could be made in the crockpot? You can make this in the Crock-Pot either by doing step one and two and transferring to the Crock-Pot or skipping that and just placing everything in the Crock-Pot and then adding the ingredients in step four before serving. Being a native of Los Angeles, I’ve had street corn (elote) a lot. I can’t wait to try it as a soup! 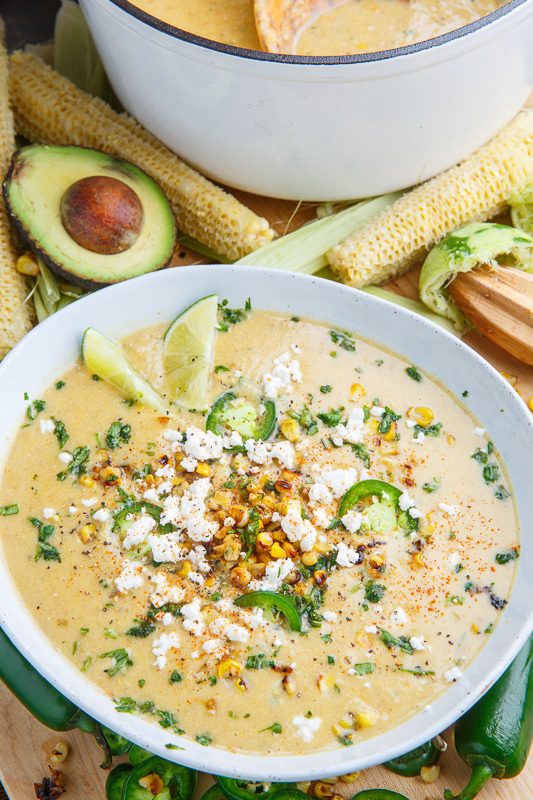 Have you tried frozen or canned corn? wanting to make this in the winter where fresh corn isn’t easily available. Frozen (or canned) will work! Enjoy!